Aliens invade in Netflix’s new film, Extinction. 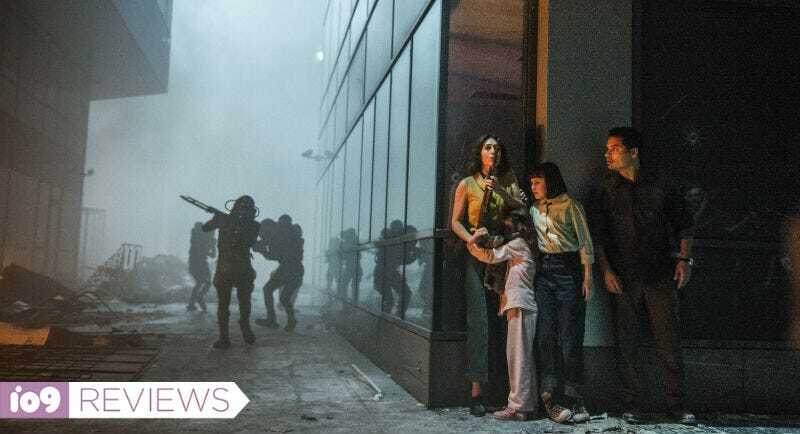 The new Netflix film Extinction stars Michael Peña and Lizzy Caplan as a married couple who try to keep their family alive during a mysterious alien invasion. It’s the kind of premise that makes you think “Oh, I’m gonna watch the hell out of Extinction.” So I did. However, when the final credits rolled, two things were abundantly clear: I totally understood why everyone involved would want to make this movie—and also, why no one should have. Directed by Ben Young, and co-written by the Oscar-nominated writer of Arrival, Eric Heisserer, Extinction has all the right pieces. It’s got a great cast, great writer, a promising director, and a solid story. It’s no wonder Universal Pictures was originally going to release it in theaters. But, at some point, Universal sold the film to Netflix, and instantly red flags went up. It turns out the studio made the right call. Peña and Caplan are better than this. So, again, Peña and Caplan play Peter and Alice, a couple with two kids in a seemingly normal futuristic society. However, Peter has been having terrible dreams of some kind of violent invasion. Alice urges him to get help, but before they know it, the visions start to come true. Aliens are invading. What they want, no one knows, but the couple does everything in their power to keep their kids safe. About an hour into the roughly 90-minute movie, Extinction turns on its head, springing a delightfully sinister twist that immediately gives the viewer hope, grabs our interest, and is almost certainly why so many great people signed on to make this movie. Unfortunately, almost every element other than the twist is bad. Almost none of the performances have any kind of charisma or emotion. That’s admittedly shocking, because Peña, Caplan, and their co-stars—including Mike Colter (Luke Cage) and Emma Booth (Once Upon a Time)—have plenty of talent. But it almost feels like they’re sleepwalking through the film, content for everything to lead up to that one twist. The twist happens, and then they just ride the story out until the end. No one is likable or sympathetic, so you don’t really care about the result. Extinction is also one of those movies where, to keep the action going, everyone has to make bad decisions at almost all times. So, sure, the daughter has to emerge from her hiding place to get her doll. And sure, we’ll stay here and shoot at the aliens instead of running away. There’s rarely a moment in Extinction that isn’t completely frustrating—which is frustrating in itself, because of all the wasted potential on display. All of Extinction looks like this screengrab from a PlayStation 2 game. And the film simply looks bad. Check out the picture above, or any the photos on this page for that matter. They’re dusty and earthy and muted. Could this be attributed to the setting being a late night urban alien invasion? Of course. But the whole movie looks like this and it’s simply not visually appealing. It doesn’t even feel like the look of the film was ever a consideration, especially when there are scenes where Peter wears a green shirt that basically blends into the hue of the movie. The whole movie almost seems like it was dragged through a swamp before being uploaded to Netflix. Extinction is a good idea in a bad package. Everyone involved should probably be happy this movie didn’t get released in theaters and will quietly live in a dark corner of Netflix. There, some viewers may click, and if they make it through the mildly intriguing first hour, they’ll be rewarded with a nice plot twist and a few action scenes that might win them over. Beyond that, though, there is very little to like about Extinction. Extinction is now on Netflix if you want to bother. Are These the Next Two Big Alien Invasion Movies? Why are we so excited about alien invasions all of a sudden?